In 1982, my career path changed when I took on the challenge of establishing the Canadian Institute for Advanced Research (CIFAR), an “institute without walls” that brought together distinguished investigators from across Canada and around the world to work in interdisciplinary teams exploring signifi cant scientific and social challenges. At CIFAR I began to focus on the relationships between early human development and the future health, learning and behaviour of populations. I have been fortunate to work with some of the best and brightest minds, and they have certainly shaped the course of my work. Among my latest influencers is Sarah Blaffer Hrdy, a Professor Emerita of Anthropology at University of California–Davis. Her study of humanity brings together economics, history, cultural and linguistic investigations and human evolution. It is a perspective that tells us much about the dynamic dance of people and place that shapes the human experience. Hrdy finds the key to our evolution in the unique length of human childhood. If the young were to survive in a world of scarce food, they needed to be cared for, not only by their mothers, but also by grandmothers, siblings, aunts and friends. Out of this complicated form of childrearing came the human capacity for engaging with and understanding one another. Mothers and Others10 knits a compelling argument that ever since the Pleistocene, it has taken a village to raise children—and how that gave our ancient ancestors the fi rst push on the path toward becoming emotionally modern human beings. These early hunter–gatherer groups were in a general sense an early child development and parenting initiative, dominated by the female members of the society. As the population grew, these small social arrangements changed and the human species evolved different forms of social organization as it developed more complex societies. With the introduction of agriculture 10,000 years ago, land ownership became very important for societies that coalesced around food production, resulting in the development of towns and cities. Children were a very important part of the manpower necessary to produce food. During this period, societies developed new tools, language and embryonic communication strategies. Increased food production led to larger communities governed by an elite of wealthy individuals, priests and rulers. These pyramidal societies frequently grew to a size that could no longer be sustained by their existing socioeconomic structures and food supplies. Empire building to acquire food and goods was offset by the cost of maintaining standing armies to subjugate conquered peoples. The Sumer, Grecian and Roman states, and the civilizations of Latin America, all fell prey to this contradiction, as would the European colonists millennia later. This same paradox mires imperialist states in conflicts today. A qualitative leap in human development occurred 700 years ago. The invention of the printing press made possible the communication of ideas among large numbers of people. With books came the need for education and an expansion of literacy. In Western countries, the Industrial Revolution led to improvements over time in transportation, energy systems, potable water, housing and the social environments in which people lived. During the 1970s, physician and demographic historian Thomas McKeown argued that the growth in population in the industrialized world from the late 1700s to the present was not due to life-saving advancements in medicine or public health, but instead to improvements in overall standards of living, especially diet, resulting from better economic conditions.14 His work resonates today due to the importance of the question that underlies it: Are public health ends better served by targeted interventions or by broad-based efforts to redistribute the social, political and economic resources that determine the health of populations? In his book, The Fourth Great Awakening and the Future of Egalitarianism (2002), Fogel described the changes from 1730 to today in relation to the socioeconomic characteristics of society.15 He described four periods of what he calls “awakening” from an American perspective. The first awakening, 1730 to 1800, showed marked attacks on British morality and political corruption, and a decline in the power of religion. These concepts fuelled the American Revolution with a strong belief in equality of opportunity that accepted the principle of inequality of income as natural. The second awakening, 1800 to 1900, resulted in substantial economic growth driven by fossil fuels as an energy source, along with new technologies, growth in manufacturing and increased urbanization. Although this revolution led to inequalities in the distribution of wealth, there was still a strong belief in equality of opportunity. The third awakening, 1900 to 1960, was strongly influenced by electricity and cars changing the nature of work and spurring urbanization. Income inequality was still accepted, but the markedly increased gap between rich and poor gave rise to anti-capitalist ideologies, social unrest and the concept of welfare. The fourth awakening, 1960 to today, has resulted in exponential growth in new technologies and knowledge, along with increased urbanization and population growth. The fourth period is also associated with two seemingly contradictory trends: an upsurge in religious fundamentalism and significant changes in the role and rights of women. The latter is an evolutionary output of the fourth awakening; the former, a reaction to it. The number of women employed in the market economy has increased dramatically. Social changes, however, have trailed economic realities. The University of Cambridge in England and Harvard University in the U.S. allowed women to attend but did not grant them degrees until after the Second World War. The Cambridge University reports for 1948 and 1949 reveal that the male-dominated Senate wondered if women were really worthy of a degree! Now women have careers in previously male-dominated fields and outnumber men in most post-secondary disciplines, including medicine, law and sometimes engineering. The education of women is strongly linked to lower fertility rates and to the survival, health and educational attainment of their children. For societies, women’s changing role has significantly affected social structures, how families function and how children are raised. It challenges our concepts of a gender division of domestic and productive labour and appropriate roles for the state in supporting families with young children. Hrdy, in reviewing the changes taking place in Western societies and the effects on mothers and children, was troubled by the percentage of children showing poor development and disorganized attachment. Until recently, in historic terms, children without committed nurturing rarely lived to adulthood. Today, 10 million children still die each year before their fifth birthday, the majority of deaths occurring in low-income countries. In rich nations, children can survive poor nutrition, neglect and even abuse, leading to a proportionb of the adult population with learning, behaviour and health difficulties. Humans are a very recent species in the history of the planet. Following the last Ice Age, the population was probably fewer than 50,000. The Agricultural Revolution supported a population boost, so that by 250 years ago we reached 750 million. In the 20th century, human density increased from 2 billion to 6 billion. In this century, there will be 9 billion human beings on the planet. 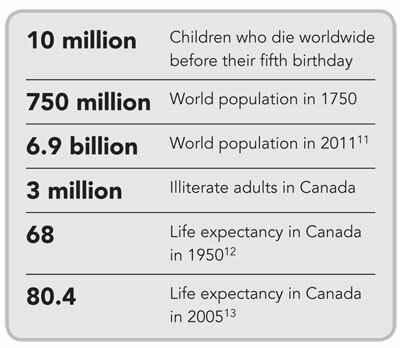 These numbers will change how we live and organize ourselves; influence socioeconomic initiatives and infrastructures; and test the limits of the environment and resource supplies. Western countries will not be immune to clashes over access to fresh water and food supplies. b 25–30% of the adult population in Anglo-American countries.